FoldR is a simple Wave Folding Audio Unit Extension from Living Memory Software who previously brought us LayR and Ostinator. 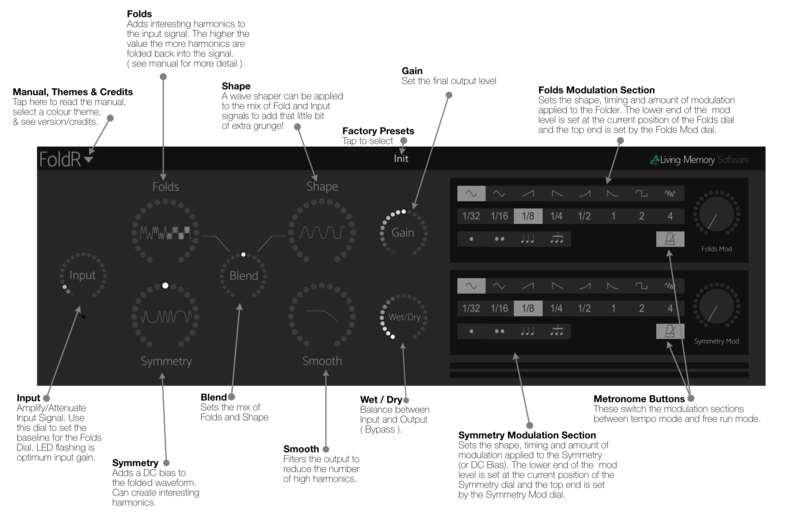 FoldR is based on wave folding, which is an interesting distortion effect that adds harmonics to the original signal by folding the waveform back on itself when it exceeds a clipping threshold. FoldR is probably most useful for for adding spice to monophonic synth leads and rhythmic, tempo based modulations can turn drum loops into totally new entities, while long, slow, free running modulations are perfect for dirty ambient drones. FoldR lets you set the folding thresholds and modulate the folding amount and symmetry with tempo based or free running modulators. FoldR also includes a wave shaper to add even more interest. There is also a short built-in manual and a selection of colour themes. You’ll also find this quick help guide useful.